I’ve never read the book that the movie was based on, so I can’t speak on how well the book would have played out, but the movie seemed to be real slow moving at times and built up to unusual moments. I also felt like the director, Michael Mann, was trying to show off some of his cool cinematography and featured it at times that seemed awkward in the movie. It seemed like five or ten times the movie just stopped so we could see the near emotionless faces of two or three actors just staring for fifteen or twenty seconds. I understood some of the stops and they worked, but at other times it just seemed forced and out of place. This movie also hit on one of my biggest movie pet peeves, no one can shoot. Apparently back in that time period guns were REALLY inaccurate. Well, I guess I shouldn’t say that since one of the first scenes in the movie we see Agent Purvis gunning down “Pretty Boy” Floyd from across an orchard of some sort with one shot. His shot gun blast to the abdomen proved fatal for Floyd at about a hundred feet. Later in the movie we will see everyone missing the broadside of a barn at about fifty feet. On to the story, the story is apparently based on real life events of a bank robber during the Great Depression. One which was apparently so big it helped grow the FBI to what it is today under the unorthodox leadership of Hoover (played in the movie by Billy Crudup). I say apparently because in the few scenes we see that begin to build Hoover’s character and his style seem too short and by the midpoint of the movie are gone. We aren’t really told what the results of this “first war on crime” are. There is talk by Purvis and Hoover about how important it is to get Dillinger, but it never goes anywhere. 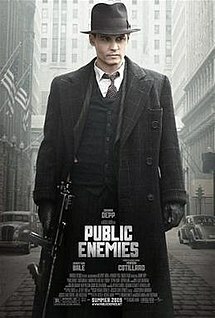 Dillinger becomes famous as a bank robber and falls in love while running away from the FBI and Purvis. Briefly we see Dillinger working with other famous mobsters of the time trying to make the big score so they can disappear to some South American country. At points in the movie Dillinger is so cocky that he doesn’t think that the FBI will ever be able to catch up to him and that he could rob banks for the rest of his life. Unfortunately there doesn’t appear to be enough of that in the movie. Most of the movie is spent trying to be suspenseful with the numskull FBI agents failing to capture him again and again and the weird love story. Johnny Depp as Dillinger in the “love” or “romantic” scenes feels awkward. I’m not sure if he was trying to show that Dillinger was damaged emotionally, but I just didn’t get the “romantic” love they seemed to be going for. It appeared in the movie that they were really only together for a week at most before the events of the movie tear them apart and most of that time is spent planning/robbing banks/running from the FBI, so how did they become so closely tied together? It sure as hell isn’t explained in the movie. Unless of course one of their many staring sessions was supposed to show how they had somehow become soul mates or something. Maybe I just don’t get that “love at first” sight idea. I’m not even sure if that is what the movie was trying to convey? Maybe I missed a passing of time that wasn’t explained in the movie. I’m beginning to question Christian Bale’s acting credentials. He seems to be popping up in everything and he seems to have the same exact persona in all of them. His facial expression seems emotionless at all times and he seems to be smitten with using a weird growling accent in every movie now. I know that it isn’t that bad in this movie, but his accent is VERY guttural. There are some great moments in the movies and some seriously good acting at times. But I think that the direction may have distracted from it at times and the plot seemed to just drag through the movie. I can’t recommend dropping $10 on this, but if you are a history buff or a Johnny Depp fan maybe you would want to pick this up from your local RedBox in a few months. It may have just not been my cup of tea. I give it 1.5 our of 5.